Though the territory’s street protests have largely died down, the pro-democracy movement proved it was in for the long haul. The umbrella is a perfect icon for Hong Kong’s uprising: inclusive, a bit aloof and pragmatically defiant of the elements (and, in cinematic lore, readily convertible into a lethal kung fu weapon). It embodies the central plea of the protesters who took to the streets throughout the city beginning on September 26: a civilized demand for self-determination. Yet the biggest worry in Beijing isn’t the threat of universal suffrage, but what might come afterward—the struggle for social justice that Hong Kongers face as they pivot between postcolonial limbo and authoritarian capitalism. The immediate spark for the protests was a controversy over the nascent electoral process. Activists were incensed by Beijing’s decree—via its proxy authority, the National People’s Congress (NPC)—that candidates for Hong Kong’s 2017 executive election must be approved by the mainland authorities. Underlying the protesters’ demands for fair elections is a frustrated generation’s desire to control its economic destiny. A statement issued by dozens of labor and community groups draws the link between an unaccountable government and Hong Kong’s economic divide: “The Chinese Communist Party has followed and reinforced almost every governing strategy used by the British colonialists,” the statement reads. “Working in tandem, the CCP and business conglomerates have only worsened Hong Kong’s already alarming rich-poor gap…. It is true that even a genuinely democratic system may not be able to bring immediate improvements to grassroots and workers’ livelihoods. However, the current political system and the NPC’s ruling are flagrant violations of our political rights as well as our right to be heard.” Beyond elections, the group demanded expanded housing protections and welfare policies, and a government responsive to the concerns of civil society groups. Today’s Hong Kong is both an amazingly sophisticated and intensely unequal economy, compared with other developed nations. One-fifth of the population lives in poverty. The minimum wage, just recently implemented at the paltry rate of $3.60, can’t offset the astronomical cost of housing and inflation and does little to curb unemployment. The former colonial trade hub has lost about 80 percent of its manufacturing jobs since the early 1990s as industries have shifted to the mainland. The most impoverished are migrant laborers, youth and women. The radicals who led the most militant protests represent twentysomethings tired of economic volatility and the stagnation of the political system. After about a week of protests, the standoff in the streets was growing more tense, with scuffles breaking out as violent counterdemonstrators rolled into the peaceful Occupy camps. The seeming reluctance of the police to intervene led some to believe that the authorities had sowed chaos to derail the movement. 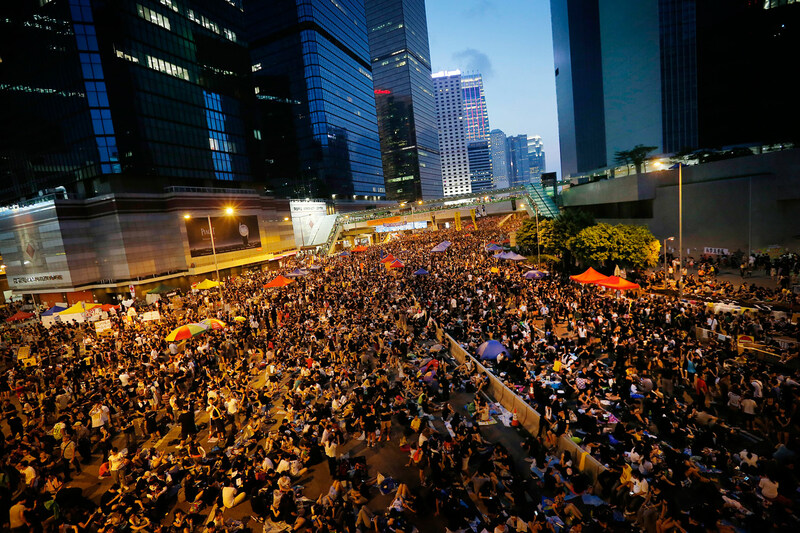 Tensions also emerged within the movement as protesters wrestled over the next steps—whether to seek negotiations with Hong Kong’s government or hold out on principle in defiance of police aggression. The authorities issued an ultimatum for occupiers to clear out by October 6 or risk an even heavier crackdown. Meanwhile, Beijing denounced the uprising as a threat to stability, though it did not intervene directly. Neither Beijing nor Hong Kong administrators seemed prepared to heed the electoral reform demands. Facing pressure to stop blocking traffic so as not to disrupt commerce and government functions, many protesters retreated. They looked to the government’s vague promises of opening official talks with activists, hopeful that this uprising marked an advance for pro-democracy forces. While the street protests have largely faded, the democracy struggle showed it was in for the long haul. In 1997, Hong Kong was handed over by Britain to its “motherland” as the crown jewel of China’s new empire. But the deal turned out to be more than Beijing bargained for. The mainland regained a piece of territory, but it never conquered the hearts of a people who are ready for true decolonization, and will settle for nothing less.